*Does not include applicable tax, shipping & handling, or other charges. 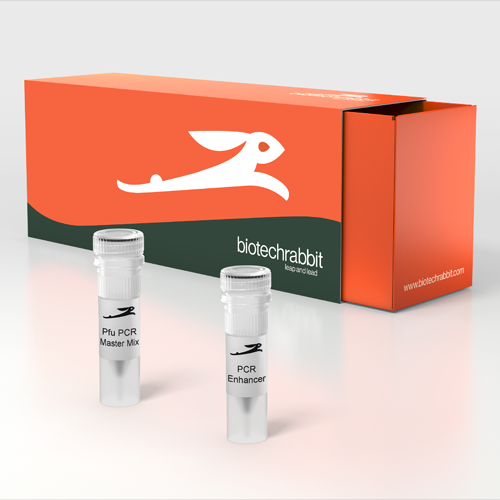 biotechrabbit™ Pfu PCR Master Mix is a perfect choice for fast, high-fidelity PCR setup that reduces the time required for calculation and pipetting and eliminates the need for buffer optimization. It is designed for routine high-throughput, high-fidelity amplification of targets up to 3–4 kb in size. The 2× Pfu PCR Master Mix contains Pfu DNA Polymerase, extremely high-quality dNTPs and optimized PCR buffer; thus, only template, PCR primers and PCR-grade water are added. For the most demanding applications, the supplied 5× PCR Enhancer can be optionally be used to improve results when using templates with GC-rich sequences and complex structures. Pfu DNA Polymerase exhibits approximately 10 times higher accuracy compared to Taq DNA polymerase. 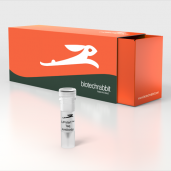 Pfu DNA Polymerase produces blunt-end PCR products suitable for blunt cloning. Human genomic DNA was amplified using the Pfu PCR Master Mix and specific primers to produce a distinct band. When assembling the amplification reactions, care should be taken to eliminate the possibility of contamination with undesired DNA. Use separate clean areas for preparation of samples and reaction mixtures and for cycling. Wear fresh gloves. Use sterile tubes and pipette tips with aerosol filters for PCR setup. Use only water and reagents that are free of DNA and nucleases. With every PCR setup, perform a contamination control reaction that does not include template DNA. The standard PCR protocol using biotechrabbit reaction buffer provides excellent results for most applications. Optimization might be necessary for certain conditions, such as the amplification of long targets, high GC or AT content, strong template secondary structures or insufficient template purity. In such cases, optimization of template purification (see biotechrabbit nucleic acid purification kits), primer design and annealing temperature is recommended. The Master Mix is designed to be used without any optimization as it has all necessary reaction components in optimal amounts for successful PCR. Optionally, use the supplied 5× PCR Enhancer to increase the yield and to lower the background in more complicated PCR reactions (low amounts of template, impure or GC-rich template). Thaw on ice and mix all reagents well. Keep all reagents and reactions on ice. Pipet the master mix into thin-walled 0.2 ml PCR tubes. 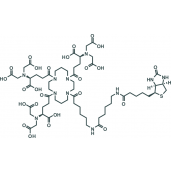 Add template and primers separately if they are not used in all reactions. Mix and centrifuge briefly to collect the liquid in the bottom of the tube. Place in the PCR cycler. Add loading dye solution (see DNA Loading Dye, 6×, cat. no. BR0800301) to the reactions to analyze PCR products on a gel or store them at −20°C. 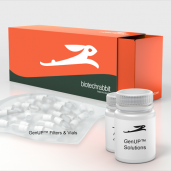 For cloning, always purify the PCR product from a gel (see BR0700401 GenUP™ Gel Extraction Kit).